The North Carolina Association of District Court Judges hired two well-known lobbyists earlier this month, according to paperwork filed with the Secretary of State. 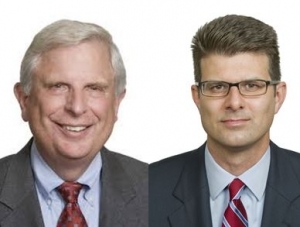 The lobbyists are Charles Neely Jr. and Richard Zechini, of the Williams Mullen law firm. Neither were immediately available for comment Friday. Neely is a former Republican member of the General Assembly. He was elected three times from 1995 to 1999 and during his tenure served as chairman of the House Judiciary II Committee, a member of the House Finance Committee and as co-chairman of the Revenue Laws Study Committee. You can read more about his background here. Zechini was a former a staff attorney at the General Assembly. He was director of public affairs with Progress Energy prior to joining Williams Mullen. He has been regularly ranked by the North Carolina Center for Public Policy as one of “North Carolina’s Most Influential Lobbyists,” according to the law firm. You can read more about his background here. They are both lobbyists for several area organizations and entities, including the Alliance for North Carolina Nonprofits, Duke University, NC Equal Justice Alliance, North Carolina Association of Realtors and CSX Transportation Incorporated. Judge Elizabeth Heath of Lenoir County, who is President of the Association of District Court Judges, was not immediately available for comment about why the group hired the lobbyists. There also is not a lot of publicly available information about the Association. The news comes just before lawmakers are expected to take up House Bill 717, a measure that would change the way judges and district attorneys are elected in North Carolina. The bill, introduced by Rep. Justin Burr (R-Montgomery, Stanly), is a redraw of the superior and district court and prosecutorial districts. It was announced by Burr without any input from the judicial or legal community and came as a surprise to many. There have also been several other bills introduced and passed this legislative session aimed at changing the judiciary, despite potential negative consequences. Two examples include HB239, also introduced by Burr, which reduced the state Court of Appeals judges from 15 to 12 and HB100 which made superior and district court judicial races partisan again. Let the fascist takeover continue by perverting the rule of law. American exceptionalism.